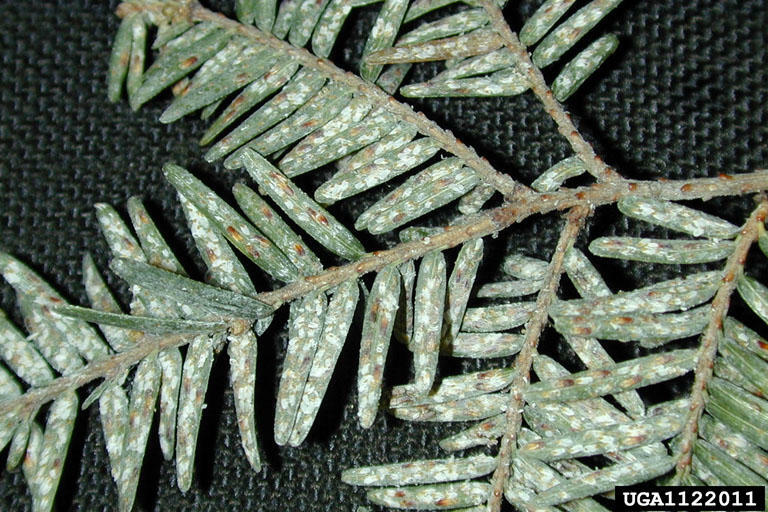 Oregon forestry officials say a potentially devastating pest hitchhiked into Oregon on a shipment of Christmas trees this year. The Elongate Hemlock Scale is mostly flat and really small: less than two millimeters long. Despite its size, it can unleash destruction on several species of evergreen trees, including many found in Oregon. The Elongate Hemlock Scale infests the underside of tree needles. Oregon Department of Forestry spokesman Jim Gersbach said some of the insects were discovered on Christmas trees imported to Oregon from North Carolina. The type of tree they were found on was a Fraser Fir, but Gersbach said it’s possible other types of trees were infected. He said an unknown number of infested trees were sold at big box stores before the rest of the stock was destroyed. Forestry officials say if you bought a Christmas tree at a box store, the best way to dispose of it this year would be to cut it up and put it in a sealed trash bag. They fear that if the trees are set outside intact or added to compost piles, the bug could spread to Oregon forests. “Once these things get established, it can be quite harmful,” said Gersbach. The bug feeds on needles, making the trees vulnerable to other threats. While Oregon is the nation’s top Christmas tree producer, the state was on track to export millions of fewer trees this year than just a few years ago, due to the cyclical nature of the industry.